Chicago Cardinals owner Violet Bidwill had married St. Louis businessman Walter Wolfner in 1949, two years after inheriting the team from her late first husband, Charles Bidwill. When it became obvious that the Cardinals could no longer hope to compete with the Chicago Bears, a move to St. Louis seemed to make sense. The NFL conducted a survey of St. Louis and concluded that it was capable of supporting a team. The league’s 12 owners unanimously approved the move, ending their 62-year stay in Chicago. 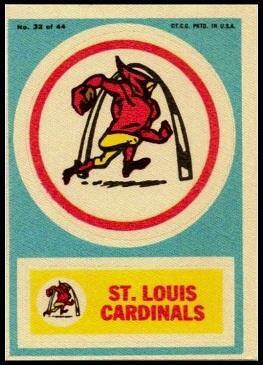 The new St. Louis football Cardinals were competitive for much of the 1960s. New stars emerged in Larry Wilson, Charley Johnson, Jim Bakken, Sonny Randle, and Jim Hart. Violet Bidwill Wolfner died in 1962, and her sons, Bill and Charles, Jr. took control. Although the Cardinals were competitive again in the ’60s, they failed to achieve a playoff appearance during the decade.